The official Seahawks season kicks off a week from tonight on Thursday, September 4, and I’m already thinking ahead to how we’re going to show our team spirit this year. Here are some of my favorites from Etsy… there’s still time to order before kick-off next week! Obviously, this is amazing. I just sent this to Josh, because we need a new mailbox and I’m feeling so tempted to order it. Even at that price. My girls would love this ribbon and I would also stash some to tie on hostess gifts for games at friends’ homes or for tying in Janie and Meg’s hair for game days at school. A fun way to add a little Seahawks spirit to an outfit without going crazy… or if you can’t be decked out in gear at work. Two Seattle faves in one mug! Love the Starbucks/Seahawks combination and these would be perfect for those 10 a.m. games this fall and winter. Because, coffee. These are cool and simple and made of vinyl, so you can use them pretty much anywhere, from your laptop to your car window. Etsy is a great place to get Seahawks shirts for a much more reasonable price than in stores. Plus, you won’t be wearing the same shirt as everyone in the state. Love this Russell Wilson version. Loving the vintage feel of this shirt and it looks super-soft, too, doesn’t it? A super fun way to show that 12th man spirit. They have a ton of other Seahawks shirts in this Etsy store, too, so be sure to browse before you buy! 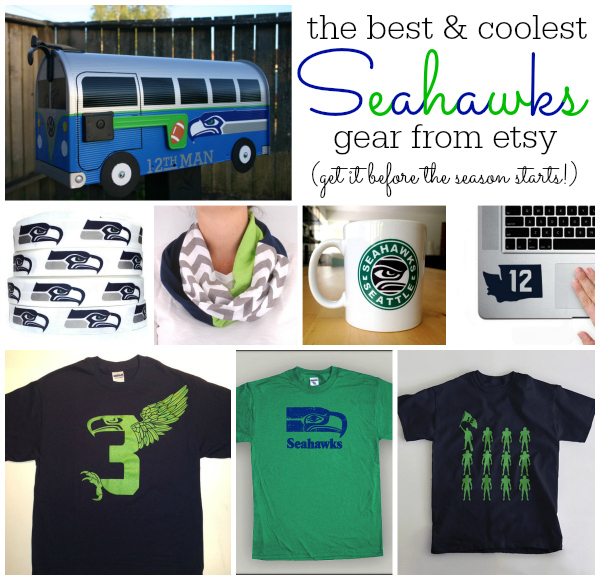 This entry was posted in Life and tagged 2014, Etsy, Seahawks, Seattle on August 28, 2014 by Katie Kavulla. Also – you’re totally gonna win ff! LOB! LOB! Reblogged this on Western States pipebursting.